Why I’m Wearing all of the Trash I Produce for the Next Month. For 30 days I am wearing every single piece of trash that I create. For 30 days I am wearing every single piece of trash that I create. At first that might just sound crazy, but anybody who knows me by now knows that I am indeed crazy, crazy in a good way. My biggest goal in life is to inspire people to think about how our little daily actions affect the world around us both near and far. By now all of us in the USA know that we create a nearly unfathomable amount of trash. You've all probably seen the horrific images of landfills bursting at the seams, bodies of water littered in trash, and animals killed or badly injured from plastics. Many of us have wrapped our heads around the massive global issues that we've created with our trash, but I think where many of us forget to put much focus is on ourselves. How are we as individuals contributing to these massive problems and what positive changes can we make today to live out a live that is in harmony with our beliefs? That's the idea of all of my activism campaigns. To put our actions front and centre and to inspire positive change. The average American creates 4.5 pounds of trash per day but most of us never think twice about the trash we make. Once it's in the garbage can it's out of sight out of mind, and although the 4.5 pounds of trash per day statistic is widely known, very few visuals exist to help people truly understand it. 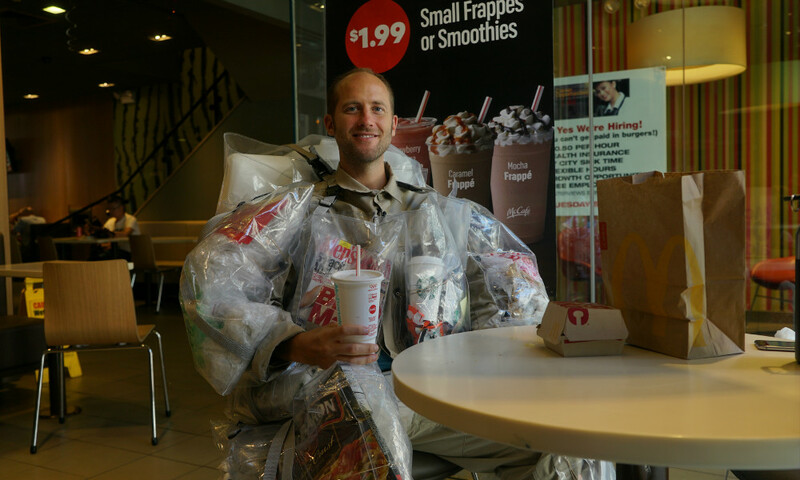 So for 30 days I am going to live just like the average American that creates 4.5 pounds of trash per day. I'll eat, shop, and consume just like millions of us are accustomed to. I'll shop at the store, go to the movies and sporting events, and socialise with friends out on the town but every where I go, I mean everywhere, I will be covered in my trash. By the end of it I'll be wearing upwards of 135 pounds of garbage. To make this possible I had to have a special suit designed by Nancy Judd of Recycle Runway to support the weight and make it visible. Everywhere I go I'll be walking billboard of American consumerism. Through this project, myself along with filmmakers Living on One and Gary Bencheghib are out to create an unforgettable and shocking visual of the trash that most of us create everyday. Throughout the month we will be producing videos that put trash front and center but go behind the scenes of why this issue matters and what we can all do to be a part of the solution. 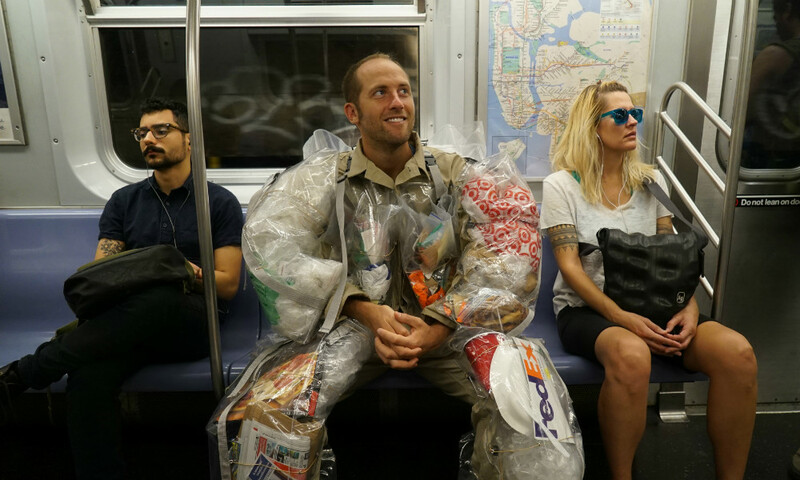 If you are on the streets of NYC keep a look out for the guy covered in his trash and come take a selfie with me using #TrashMe. And wherever you are in the world you can follow along on my website, Facebook page, and YouTube channel. 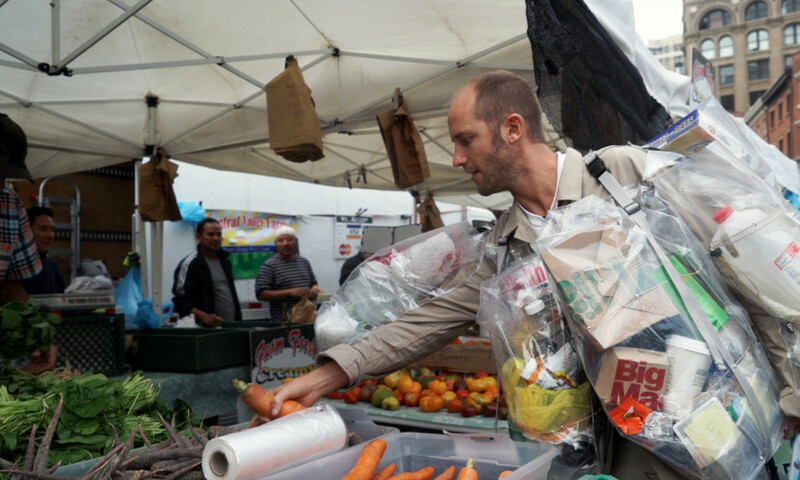 Read this next: This market uses trash instead of cash!